Espoir D'Allen gave trainer Gavin Cromwell a first Cheltenham Festival triumph with victory in the Champion Hurdle. The 16-1 chance, ridden by Mark Walsh, stormed clear as the leading three runners failed to make an impact. Two-time winner Buveur D'Air fell at the third hurdle while mares Apple's Jade and Laurina faded in the final shake-up. Melon (20-1) was second ahead of Silver Streak (80-1). Espoir D'Allen, like Buveur D'Air owned by millionaire JP McManus, becomes only the second five-year-old to win the race in 34 years. It is the eighth time McManus has won the race. Cromwell, based in County Meath in Ireland, is a farrier by trade and before he concentrated on training he counted leading trainer Gordon Elliott among his clients. And he was speechless at landing the biggest win of his career. "I am shell-shocked," he told BBC Radio 5 Live. "He absolutely skated up, I am so lost for words. It's just unbelievable. "He's been winning Grade Threes this year, so to win this is fantastic." Walsh earned his first Cheltenham win on board the Willie Mullins-trained Bleu Berry in last year's Coral Cup and has regularly ridden for McManus, but this was the biggest win of his career. 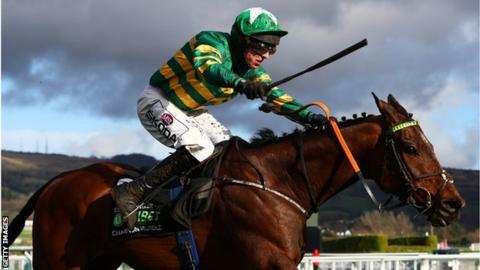 "For a five-year-old to do that against what we thought was one of the best Champion Hurdle fields for the past few years is unbelievable," said the 32-year-old. "I was behind Barry [Geraghty, on Buveur D'Air] when he fell and luckily I wasn't in his way. I just travelled everywhere. "I was delighted when the rain came this morning because he goes so well in it. "I was hopeful. I was riding for a place to be honest, but from the third-last Ruby [Walsh, on Laurina] missed it. He just took me to the second-last and was in front plenty soon enough. "I heard a horse coming and only realised after the last it was a loose horse. "For a five-year-old to do that is very good." It probably shouldn't, but the result of the Champion Hurdle left a slight hollow feeling with none of the 'Big Three' making the first three places. That shouldn't take away from Espoir D'Allen, only young and with clearly a potentially big and very long future ahead of him, because he won this race as easily as you ever see in one of this magnitude. Of the principals, the feeling was that reigning titleholder Buveur D'Air's jumping is so slick that it leaves only a small margin of error and he didn't get things right. Laurina ran fine in fourth but Apple's Jade dropped away tamely. Trainer Willie Mullins had a perfect start to the day with a 41-1 double thanks to wins for Klassical Dream (6-1) in the Supreme Novices Hurdle under Ruby Walsh and Duc Des Genievres (5-1) with Paul Townend in the Arkle Chase. But his hopes of a treble were ended in dramatic fashion in the Mares Hurdle where the odds-on favourite and last year's winner Benie Des Dieux and Walsh fell at the final hurdle when well clear. Both were unhurt. It was an uncanny repeat of the circumstances in which the same owner Rich Ricci's Annie Power fell at the last hurdle four years ago and it left Roksana, trained by Dan Skelton and ridden by his brother Harry, to win by two and a quarter lengths. The day finished on a sombre note for Mullins who lost Ballyward in the final race of the day, the National Hunt Challenge Cup for amateur riders. The 9-4 favourite fell at the 17th of 25 fences in the hands of the trainer's son, Patrick, and had to be euthanised. The race was won by Jamie Codd who guided Le Breuil to victory by half a length in front of Discorama. Elsewhere, Nicky Henderson got his first winner of the 2019 Festival when Beware The Bear (10-1) took the Handicap Chase under Jerry McGrath. A Plus Tard (5-1 favourite) gave Rachael Blackmore her first Festival success in the Novice Handicap Chase. Blackmore is one of the rising stars of the sport and is second behind Townend in the race to be crowned Irish champion jockey.